At a working width of 2.8 meters and a production speed of 2,000 meters per minute, TM 7 produces toilet paper and paper towels from 100 percent virgin pulp. Photo courtesy of Voith. Sept. 6, 2018 - Gomà-Camps' subsidiary Gomà-Camps Consumer in March of this year successfully started up a new tissue machine at its Ejea de los Caballeros mill in Spain. 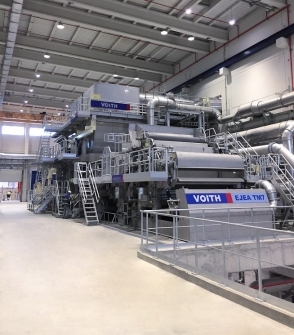 The centerpiece of the new production line is a Voith-supplied XcelLine tissue machine, TM 7. “From stock on wire, to paper on reel it took only 30 minutes, and the TM 7 speed-up is over achieving the planned start up curve. This was a great team performance,” said José Ignacio González Sarasúa, Mill Manager of Gomà-Camps Consumer. At a working width of 2.8 meters and a production speed of 2,000 meters per minute, TM 7 produces toilet paper and paper towels from 100 percent virgin pulp. At full operating speed, which is expected by the end of 2018, TM 7's production capacity will be 34,000 metric tons per year. Voith delivered the entire process line package: from BlueLine stock preparation and the double dilution approach flow system, the TM 7 XcelLine tissue machine, auxiliary equipment and system accessories all the way to the full automation, electrification and engineering. In addition, extensive services and replacement parts were included in the delivery, such as the entire clothing package, which is ideally coordinated with the requirements of shoe press technology. The entire new plant will be serviced 100 percent by Voith in an integrated maintenance and service concept. With the new tissue machine in Ejea, the Gomà-Camps Group increases its annual tissue manufacturing capacity to 90,000 tons. Gomà-Camps (www.gomacamps.com) is a family business group founded more than 260 years ago and present on the international market. The Gomà-Camps Group's mission is to manufacture, process and trade tissue paper and other similar products that provide value added for their customers, shareholders, Gomà-Camps employees, and their social environment. Voith Paper is a Group Division of Voith and a leading partner and pioneer in the paper industry. To learn more, please visit www.voithpaper.com.